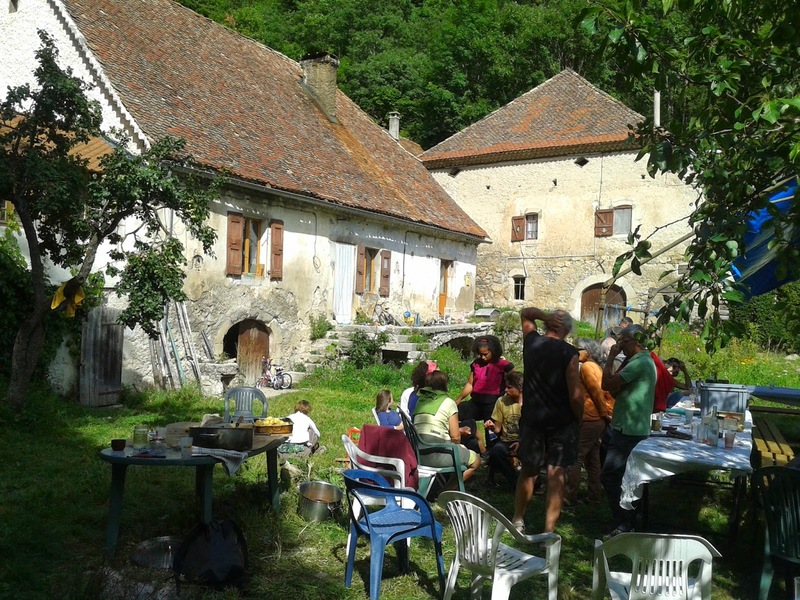 Last Sunday, I travelled across France and deep into the Southern Alps mountain range to the tiny village of Glandage where I am enrolling into a social experiment. A batch mate from my agricultural development economics MSc has settled down there with her husband and children after many years spent working in Bolivia. They have started a farm on a small plot of land in a narrow mountain valley where they grow old forgotten varieties of vegetables. They also have plans to produce lamb. However, to have a sizable flock, they need more land, which they could not afford to buy with their current capital. Rather than going to the bank to request a loan, they have decided to constitute an agricultural land group with 45 of their friends. This is a legal framework in France (Groupement foncier agricole) that is relatively rare. It allows several individuals to create a group to own agricultural land collectively and decide in a collective manner how to manage it. Co-ownership is very common for buildings in French cities; this is likewise co-ownership of agricultural land. In this case, my friends Christophe and Margot would become our farm tenants and the lease contract would specify that they are allowed to use our land to graze sheep and cut wood. The land the group is planning to buy is currently on a very steep slope and unused. It is thus slowly and naturally becoming forested, which does not make it useful for agriculture. The plan of the co-owners and their farmer, once all the legal procedures are over, is selectively to cut trees on the land so that it opens up and becomes suitable for natural pasture grazing by the ewes and their lambs. There is no economic incentive for the grouped land owners. On the contrary, we decided on Sunday that the contract creating the group should specify that individual investors should not expect to sell their share of the common land at market value! So what are the motivations of the land's co-owners? Among those that were voiced at the group meeting this Sunday: to help out friends who want to settle as farmers and make sustainable use of under-utilized agricultural land; to engage in a model of common ownership of land that is different from the more common individual property model; to allow Margot and Christophe to see people from time to time as they launch group activities on their very remote farm, etc. I say it is above all a social experiment because every year, the farmers will invite the land co-owners for a lamb barbeque accompanied by the farm's vegetables. We had a wonderful communal feast last Sunday. We were invited to bring a drink or some dessert. So in addition to the lamb and vegetables, we had locally brewed beer, delicious wines, freshly plucked apples and pears, cakes galore and a selection of handicraft chocolates prepared by a local couple with cocoa beans they selected themselves in Ivory Coast. I can also tell you that the lamb meat was delicious! I have no doubt that Christophe and Margot will manage to find a good and remunerative market outlet for their naturally grazing mountain lambs.